Someone asked me recently, “How are Returning Citizens different from the ordinary person in regard to the search for happiness?” Happiness is one of the most important elements of existence. One doesn’t have to be incarcerated to experience poverty, degradation and/or oppression, but if you are in prison, the chances that you will face such tragic circumstances are greater, and this can influence happiness. Just yesterday, I was talking to a 50 year old African-American man who served 30 years in prison. We spoke about change and the reentry process. He said, “It’s hard being poor. The only thing worse than being poor is being in prison.” Prison can be a most destitute situation. There can be many obstacles in the way of success after prison, and this can make the search for happiness more difficult for an individual. The inability to achieve personal growth impedes happiness for the ordinary person. This can be especially true for someone who has been formerly incarcerated and has felt oppressed. The system mostly denies the opportunity to achieve self-actualization. You may be interested in: What is a mental health court? 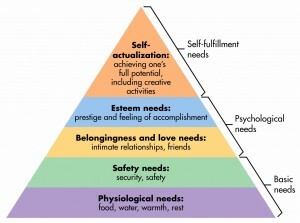 Incarceration prevents one from achieving almost every level of Maslow’s Hierarchy: physiological, safety, and meeting social and self-esteem needs. In prison many people suffer mentally and physically due to stress-related illnesses. Prisons are unsafe places. I’ve heard horror stories about men sleeping in their boots; fully dressed for fear that a correctional officer might let someone into their locked cell at night to harm them. Many people who are imprisoned are impoverished mentally, academically, physically and spiritually prior to incarceration. During their confinement, sadness and depression often set in as a result of the lack of companionship, isolation and trauma. During release, individuals strive to reintegrate, and they face stigma, discrimination, and anxiety and have to confront unrealistic expectations imposed by others who may be impatient with the reentry process. Many formerly incarcerated people suffer with dual diagnoses: drug addiction and mental health. The issues can feel endless. Maintaining a positive state of mind and pursuing happiness is a gigantic job for Returning Citizens. One must be intentional and focused to achieve that state of grace. Related: Inside a mental hospital called jail. Tagged After Incarceration, Mental State of Released Prisoners. Bookmark the permalink.